Philips brings 4K Ultra HD, HDR and tiny projectors to its 2015 TV range | What Hi-Fi? Aiming to combine cutting-edge performance with innovative design, Philips has announced its most innovative, technology-heavy range of televisions ever at IFA in Berlin. Today in Berlin, Philips has taken the wraps off its latest TV range. The flagship 9600, initially available only in 65in size, is a 4K UHD LED model that also incorporates HDR (high dynamic range) technology. Deployed in tandem, these technologies promise state-of-the-art picture performance from a TV that certainly looks worthy of its Red Dot and iF Design Awards. Philips, of course, is not shy of piling on exciting-sounding innovations, and consequently the 9600 includes Bright Premium (claimed to deliver class-leading brightness and contrast) and Micro Dimming Premium (which allows individual adjustment of each of the 256 segments the screen’s backlight is divided into). There’s also the Pixel Perfect Ultra HD Engine (to optimise sharpness, motion and colour) and four-sided Ambilight technology to create (in Philips’ words) ‘a picture without boundaries’. Factor in the speaker system incorporated into the design (two forward-firing tweeters and three rear-firing subwoofers driven by a total of 50 watts of power), Android TV smart capability and a remote control with QWERTY keyboard, swipe-pad and voice recognition functionality, and the 9600 is quite obviously a very serious proposition. Not quite of ‘flagship’ status, but well worth a seat at the top table at the very least, the Philips AmbiLux takes the company’s venerable Ambilight technology forward in a remarkably innovative way. The AmbiLux (again a 65in product and again a recipient of some quite prestigious design awards) is a 4K UHD model powered by Android TV. But where a regular Philips Ambilight screen uses rear-firing LEDs to create a halo of light behind the screen, the AmbiLux features nine pico-projectors. Philips claims its ‘intelligent overlap’ technology allows a seamless projection of the on-screen image, colour and motion onto the wall behind the TV to create a more immersive image, one that “truly breaks the boundaries of TV viewing”. Or would you prefer curved? The rest of the Philips 2015 range of TVs may be slightly less attention-grabbing but that doesn’t mean it’s not interesting. 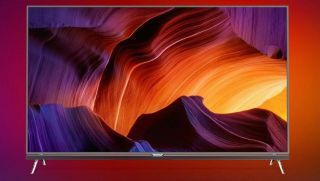 The 8700, for example, is a curved 4K UHD TV with three-sided Ambilight and an integrated (and equally curved) soundbar. It’s available in 55in and 65in versions. The 8601, meanwhile, is a flat Full HD model (again available in 55in or 65in variants) with four-sided Ambilight and is packing a total of 18 speakers (16 of which sit in detachable housings so they can be placed wide of the screen for a greater spread of sound).